338 pages | 18 Color Illus. | 83 B/W Illus. 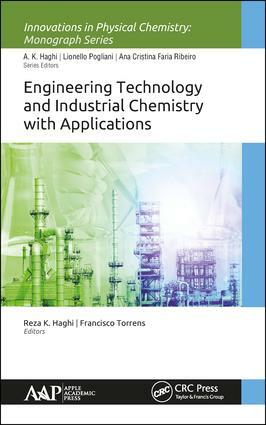 This volume, Engineering Technology and Industrial Chemistry with Applications, brings together innovative research, new concepts, and novel developments in the application of new tools for chemical and materials engineers. It provides a collection of innovative chapters on new scientific and industrial research from chemists and chemical engineers at several prestigious institutions. It looks at recent significant research and reports on new methodologies and important applications in the fields of chemical engineering as well as provides coverage of chemical databases, bringing together theory and practical applications. Highlighting theoretical foundations, real-world cases, and future directions, this authoritative reference source will be a valuable addition for researchers, practitioners, professionals, and students of chemistry material and chemical engineering. Reza Haghi, PhD, is a research assistant at the Institute of Petroleum Engineering at Heriot-Watt University, Edinburgh, Scotland, United Kingdom. Dr. Haghi has published several papers in international peer-reviewed scientific journals and has published several papers in conference proceedings, technical reports, and lecture notes. Dr. Haghi is expert in the development and application of spectroscopy techniques for monitoring hydrate and corrosion risks and developed techniques for early detection of gas hydrate risks. He conducted integrated experimental modeling in his studies and extended his research to monitoring system to pH and risk of corrosion. During his PhD work at Heriot-Watt University, he has developed various novel flow assurance techniques based on spectroscopy as well as designed and operated test equipment. He received his MSc in Advanced Control Systems from the University of Salford, Manchester, England, United Kingdom. Francisco Torrens, PhD, is lecturer in physical chemistry at the Universitat de València in Spain. His scientific accomplishments include the first implementation at a Spanish university of a program for the elucidation of crystallographic structures and the construction of the first computational-chemistry program adapted to a vector-facility supercomputer. He has written many articles published in professional journals and has acted as a reviewer as well. He has handled 26 research projects, has published two books and over 350 articles, and has made numerous presentations.